Cultural Events — Diné Studies Conference, Inc. This year, based on input from our membership, we are offering four cultural activities beginning on Friday evening (October 26). Read about all four evening events and sign up. This year, Mr. Sam Slater, provided workshops to many communities throughout the Navajo Nation and to students at University of New Mexico. This workshop during the upcoming conference will provide the seven participants will engage directly with Diné philosophies of cultural arts education. Participants will learn the foundations of Navajo moccasin making through completing a miniature pair of kélchí. 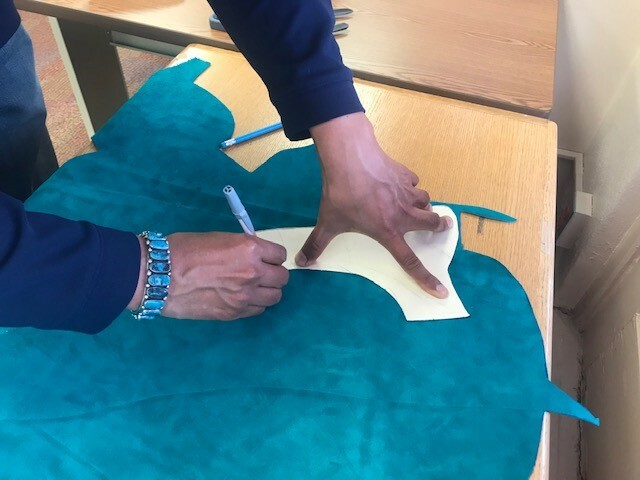 Workshop leaders will discuss the cultural significance of moccasin making and how it connects themes of emergence from times of creation to an everyday act of resistance through living and wearing Diné values. This workshop is scheduled for Friday, October 26, 2018 from 6 to 9 p.m. and the second part is scheduled for Saturday, October 27, 2018 from 3:15 to 5 p.m. This will be occurring during the Cultural Activities Evening and Afternoon sessions. Due to the large cost, we are asking only participants that will commit to attending both sessions. We are also opening this workshop for observers to watch and learn (those that cannot join the workshop). There is a required liability form that you will need to submit before you begin the workshop. To reserve your spot, RSVP here. This event is free. This past year, Crystal Littleben, the former Miss Navajo Nation kicked up a host of cultural workshops throughout the five Navajo agencies. One of those workshops she provided was button making workshops. In this workshop, Ms. Littleben will provide an introductory Navajo stamping workshop where participants will create their own stamped bracelets. This workshop is scheduled for two sessions. The first five will be assigned to Workshop 1 and the second group will be signed up for Workshop 2. We will not accommodate any changes since this is a first come – first serve basis. Workshop 1: Friday, October 26, 2018 from 6 to 9 p.m.
Workshop 2: Saturday, October 27, 2018 from 1:15 to 3 p.m.; 3:15 to 5 p.m.
Due to the large cost, we are asking only participants that will commit to attending the full workshop session. We are also opening this workshop for observers to watch and learn (those that cannot join the workshop). There is a required liability form that you will need to submit before you begin the workshop. Photo from Navajo Times. Photographed by Ravonelle Yazzie. Rhiannon Sorrell, Diné College’s librarian, will provide a tour of the R.C. Gorman Room. R.C. Gorman (1931-2005) is one of the most prominent Navajo artists. New York Times called him “the Picasso of American Indian art”. Sorrell will describe the collection of R.C. Gorman that he gifted to Diné College. The R.C. Gorman collection consists of books, photos, pictures, and memorabilia that celebrates his life. The tour will also provide an overview of the library full collection of materials and items. James McKenzie, the former Navajo Language Institute Director at Diné College, will provide an evening lecture to discuss the work of revitalization of the Navajo Language. For years, a commonly observed need to better address the perpetuation of Navajo language and culture has existed on Navajo Nation. How can advocates and educators for Navajo language and culture bring people together from various walks of life to share, learn and organize around the many topics and issues related to creating more concerted, unified efforts to perpetuate the Navajo language and culture and their use in daily life for generations to come. This presentation reflects on one such effort, the Navajo Language and Culture Revitalization Summit of 2017, along with other opportunities to ensure for the vitality of Navajo language and culture into the future.